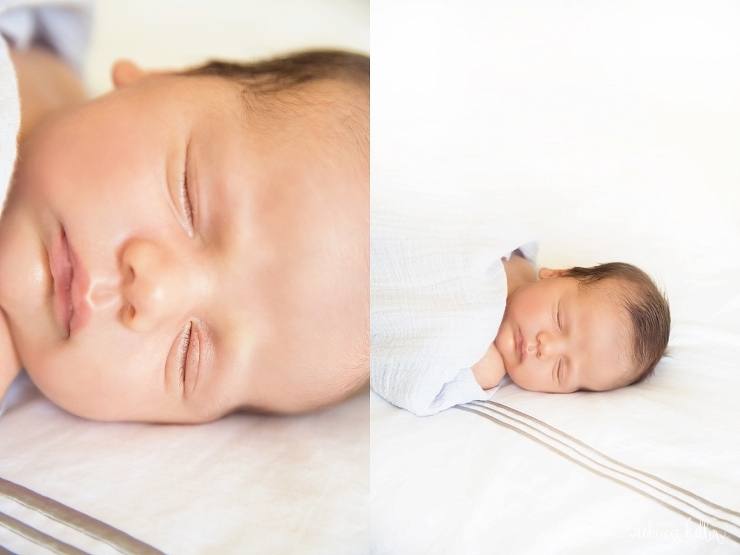 Oh my, this sweet little boy just slept and slept during his entire newborn session. 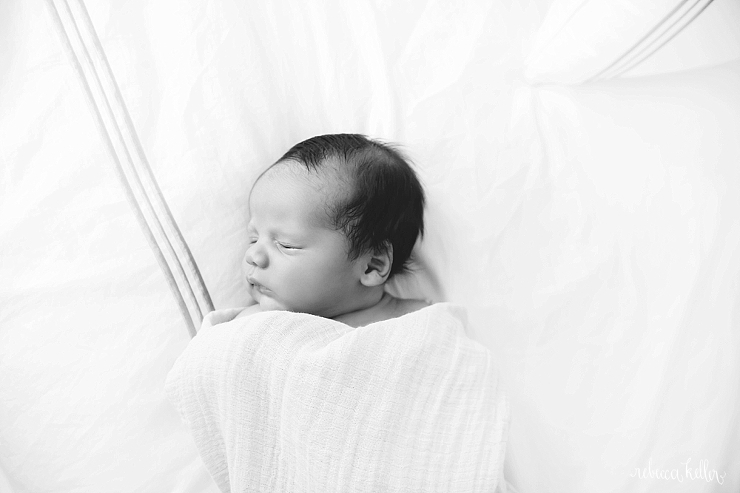 With a newborn, everyday can be so different and their schedules can be different so just never know what they are going to do…but this sweet little guy just stayed in dreamland the entire session. Love all these sweet images with his parents! Such a cutie! What was the first thing you thought when you saw your baby for the first time? I thank God he was healthy and so perfect. I felt blessed to have my baby in my arms and my husband and family right next to us. What was your favorite part of our session together? Becky made us feel very comfortable from the moment we met her when she arrived at our home. Getting direction from her was very helpful to be able to take pictures with our newborn without waking him up. Hehe. How did you prepare the baby for our photoshoot? I fed him right before the shoot and during the shoot. Half way through. How was your experience having your newborn photographed? Were you stressed or worried beforehand? I was nervous that he will get uncomfortable but it turn out great! He was very relaxed and helpful. What would be your advice to someone getting newborn photographs taken? Don’t worry too much about it. Newborns sleep most of the day and they will cooperate. Most of the time is the adults that are nervous. Hehe. Also, Get a good swaddle blanket that will be fitted to the baby. The fact that it is now August is breaking my heart. Only 17 days of summer left for my boys, and I will miss my oldest so much when he goes back to school. What are your last summer plans? I feel like I need to squeeze in every last bit of summer the next few weeks. I loved these watermelon minis so so much because they just scream summer. (And I miss pretty sunny summer days, when, oh when is all this rain going to stop?!?) Watermelon, fourth of july and a blue truck. What more do you need? This little cutie was just so happy + laughed at Ericka and I for being so silly. Love all the sweet pictures of her with the watermelon! I had to start off this post with talking about the big news for this week – Holiday Minis Booking! We have already sold out of many dates, so if you are thinking of getting on our calendar, contact us ASAP. It’s going to be such a fun fall, and I cannot wait! So I’m not sure if they are open yet, or maybe really soon sometime in August, but I’m super excited to check out the Morgan Street Food Hall. I love following the #debtfreecommunity hashtag on instagram, and my favorite follow lately is @nottodaytarget And if you follow the hashtag for #debtfreecommunity, there are so many inspiring stories and you just want to clear your amazon cart immediately. So interesting things on netflix I have watched this week while editing – 1. Undiscovered Disney Parks. This has to be filmed in the early 2000s because of the paper fast passes. The fun thing about it is you get to see inside Club33. 2.Amazing Interiors. I haven’t finished watching this yet, but wow there are some intense houses. My husband’s Carolina room is nothing compared to this guy’s Cubs basement which is really like a full blown bar. We’ve been working on a big project at our house over here, giving the boys’ playroom a big overhaul + planning a big lego table. I’m super excited about it and will post pics soon! Most of the overhaul is minimalizing. I feel like with kids + toys, it’s a constant struggle with the toys. My boys only play with Legos + Cars right now, so trying to donate what we can. This has been a busy week of editing, planning, and scheduling. Ericka and I are finalizing everything for fall, tracking down places + props and working on a lot behind the scenes. My hair is oily in my scalp and then super dry. Especially during the summer. I tried Aveda’s Dry Remedy this week and it’s absolutely amazing. Looooove it. Ebay for toys. So my son is one of the biggest lego builders on the planet. He loves reading the magazine, visiting the Lego Store (we were just here two days ago during our last apple camp trip, nothing is new) and spends hours building and rebuilding. One of the things about lego is they stop selling sets and then you can’t get them. He’s currently all about The LEGO NINJAGO Movie + all things Lego Ninjago. So I introduced him to finding sets to buy with his allowance on ebay, which is amazing. You have to hunt, but you can find discontinued sets or even regular sets someone has opened and put together and then taken back apart for so much cheaper than buying new at the store. He now loves spending his one hour of ipad time on ebay. Love it. My sister in law brought these to the beach a few weeks ago, and my boys brought them home after a shopping trip with their Mimi. What a cool summer toy at the beach. They are super cute – see a video of them here. The Tanger Outlets in Mebane. I am still driving food back and forth for my dad every week from the amazing Lemon Tree in Wake Forest. He is doing awesome. He’s recovered really well from his surgery + he is driving and back to work. Just eating a low sodium diet can be tough and Stacey from The Lemon Tree really works with the diet to make amazing meals. My mom and I have been trying to meet to make the drive a little easier since I pick it up at 2pm on Thursdays which can be tough driving around Raleigh’s crazy traffic. Yesterday on the way home, I had to take 147 to go around traffic to 540, then got off on 70 to Westgate to Leesville to Norwood…ha…all to avoid as much 540 as possible. Thankful I married Michael with his amazing map brain so I knew about all of these alternate routes. All that to say we met at Tanger this week and I was pretty amazed at the outlets. I feel like they’ve added a lot of great stores. Piper’s Tavern’s Brunch. We tried their brunch Sunday and I thought it was really reasonable and delicious. Sharing images from the beach because I’m already ready to go back. I heart summer + will be so sad when it ends! Harrison had a fun time splashing in the ocean and playing in the sand before I took these – ha!